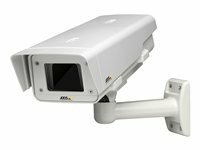 AXIS T93F05 protective housing is a pure protective enclosure. AXIS T93F has IP66 and NEMA 4X protection rating against the ingress of dust, windblown dust, rain, high pressure water jets from any direction, hose-directed water, and damage from external ice formation. AXIS T93F series is out-of-the-box ready for installation outdoors. AXIS T93F offers an empty space behind the camera, useful if a larger lens is needed for the camera or to place other devices.